This smooth, velvety ointment is specifically formulated to treat psoriasis, but is healing to dry, chapped skin as well. Calendula flowers impart a deep golden tint to the pale yellow colored safflower oil along with extra antibacterial and healing properties. Turmeric is especially valued in Ayurvedic skin care. Cautions: Turmeric oil can cause some staining to skin. 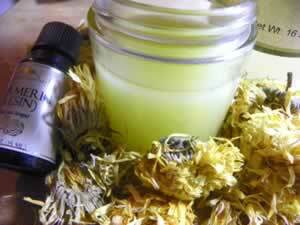 Make the base oil by infusing dried calendula flowers in safflower oil for 2 weeks. Heat the oil and wax together in a double boiler, or heatproof Pyrex measuring cup in a water bath, until the wax is completely melted. Add turmeric oil while still warm, but not set. Cap and store. Its ready to use. Psoriasis : Unlike skin conditions that are the result of external causes, psoriasis is an autoimmune disorder, and runs in families (like it does in mine). Salve :Home recipes for healing balms and salves for your home herbalist first aid kit. Blister balms, cold sores, cuts, scrapes, rashes, sunburn, good for almost any skin irritations. Summer :Summer remedies - the best herbal ice teas to cool down summers heat- plus gardening tips, fresh herbs for grilling - insect bites and summer skin care.